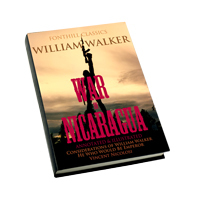 General William Walker’s WAR IN NICARAGUA—written at the close of a long civil war in Nicaragua and on the eve of the bloody American Civil War—is an autobiographical testament by one of the most infamous mercenaries/conquistadors in Latin America history, and one of the most elusive and fascinating figures in the history of North America. As with Julius Caesar’s DE BELLO GALLICO (which the author as a boy read and reread in Latin), Walker wrote this account in third person—with himself and his endeavors at dead center, and like Caesar, Walker is dispassionate and articulate, thorough and insightful. This momentous narrative, in a definitive, all-new illustrated edition—with corrected text, voluminous notes and annotations, maps, chronology, an extensive glossary, and with General Walker’s own registry of his Army—makes this Fonthill Classic Edition, quite literally, the most useful and engaging version of this important literary and military classic ever published.